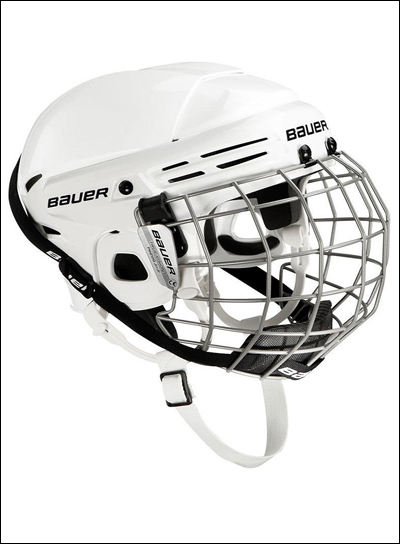 This hockey helmet comes with a face cage with chin guard and straps, directions, and warranty from the manufacturer. The helmet and face cage are easily adjustable and will grow with your child over time. If you purchase a clear face cage or shield they will work with this helmet. HELPFUL INFORMATION FOR MEASURING YOUR LITTLE ONE? To measure the head size of your little one for the best helmet fit you want to measure the widest part of their head using a tape measure. To measure the circumference you want to get a measurement around the head, start around the forehead just above the eyebrows. You can also use a sheet of paper instead of a tape measure by making marks on the paper; you can then measure your markings on the paper to figure the circumference. If you happen to know your little one?s Hat Size this Hockey Helmet is (6 1/2 - 7 1/8).